I recently came across a box stored away, filled with tubes of paint. These are colors that I do not use in my daily landscapes, so I decided to try them out in an abstract painting. Little did I realize just how much paint goes into a palette knife abstract, if you really want it to have great thick texture. 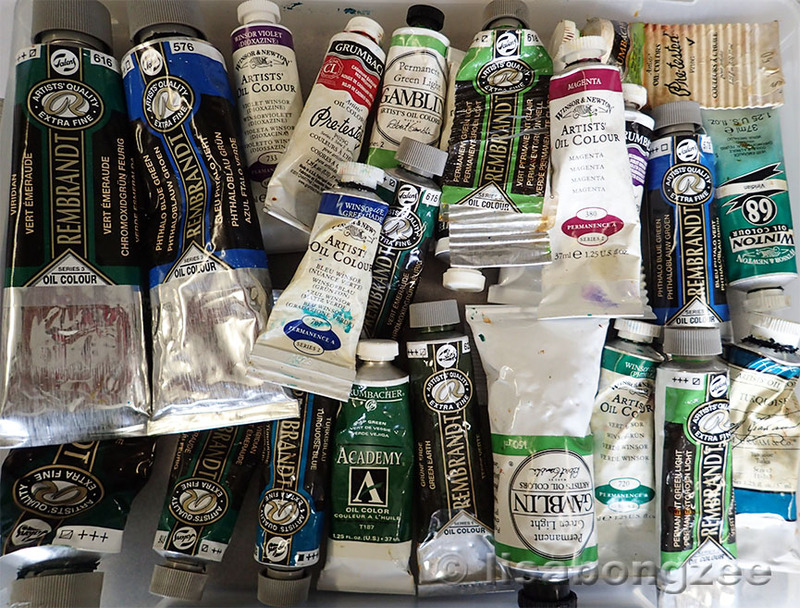 Luckily, since these were not my everyday paints, I had no problem using them excessively. But let me tell you something......Phthalo Blue Green has a dark side! In my opinion, Phthalo Blue Green is the Kool-Aid, the grape juice, the blueberry, the red wine of paint colors. 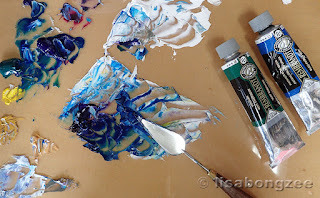 I am normally a pretty clean painter, but after just a few minutes with Phthalo, I was finding little deep blue, hard to remove, spots everywhere - on my hands, my face, my clothes, countertops, door knobs, even the refrigerator was not safe! 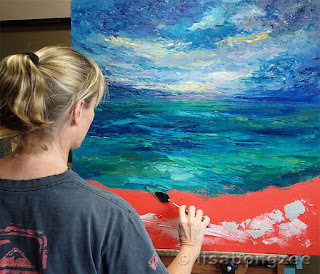 It quickly reminded me why I do not use this color in my day to day painting, although it IS truly beautiful (when you are able to get some of it onto the canvas). The abstract is going well so far. Maybe by the time it is pau, Phthalo Blue Green and I will have learned to play nicely together!